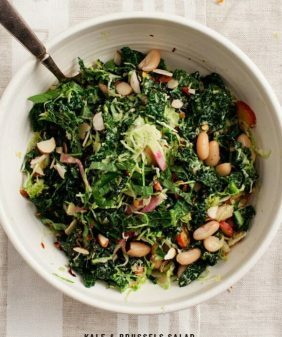 I’m continuing my kale pesto kick with this easy throw-together grain salad. 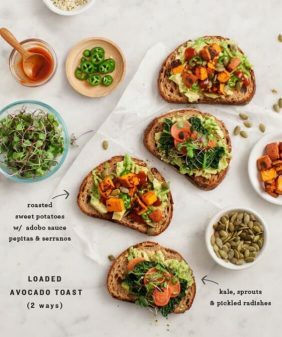 This was based around ingredients I already had in my fridge and pantry… come to life with spoonfuls of the pesto I had made earlier in the week. Feel free, with this one, to sub in ingredients that you have on hand. 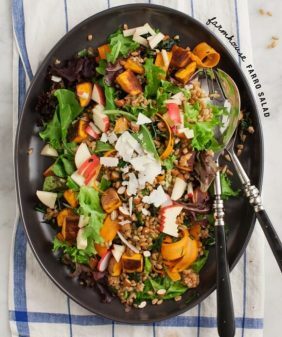 The farro could be wheatberries or quinoa, the arugula could be shreds of raw kale leaves, the radishes could be another crunchy veggie. Make a big batch and save some for lunch the next day. Serves 2 as a main, 4 as a side. Scale accordingly. Start by cooking the farro. Bring ½ cup farro and 1 cup (salted) water to a gentle boil. Reduce and simmer for about 25-35 minutes. (Check it at the 15-20 minute mark, give it a stir to make sure it’s not burning/sticking to the bottom of the pot. It’s done when it’s tender and chewy, not crunchy and not mushy). Drain farro, shaking out excess water. 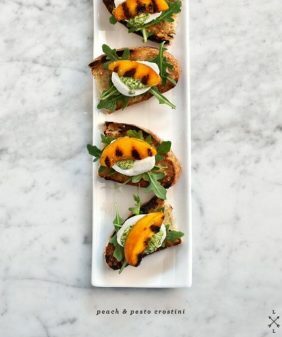 Toss it with olive oil, salt, pepper and the arugula. Drizzle with balsamic vinegar, lemon, lemon zest, some of the pesto, some of the grated cheese and toss again. Taste and adjust seasonings. Finish the salad with radishes, a few more dollops of pesto, and another grating of cheese on top. How delicious! And where did you get that beautiful plate??? thanks! I think I got the plate on Etsy, it’s vintage. I seriously think we have the same taste buds. I made almost the exact same kale pesto the other week and farro was my very favorite grain before going GF. Have you tried it for breakfast? I highly recommend partially grinding it and cooking it as a porridge. Yum! 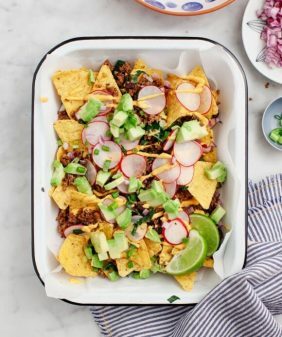 And super YUM to this entire dish! I haven’t tried it for breakfast, but I’ll have to, thanks! Yes, this is the best kind of food. Greens and grains and a tasty sauce/pesto to bring it all together. Such a winning combo on this one too. I’ve been enjoying the heck out of farro lately. Lovely inspiration, Jeanine! I could make it with quinoa, I am eating it all the time lately. This is exactly the kind of lunch I love, and such a nice way to make the most of early spring ingredients like kale and radishes. 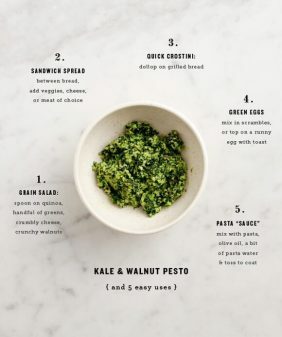 I totally have a crush on kale pesto too. 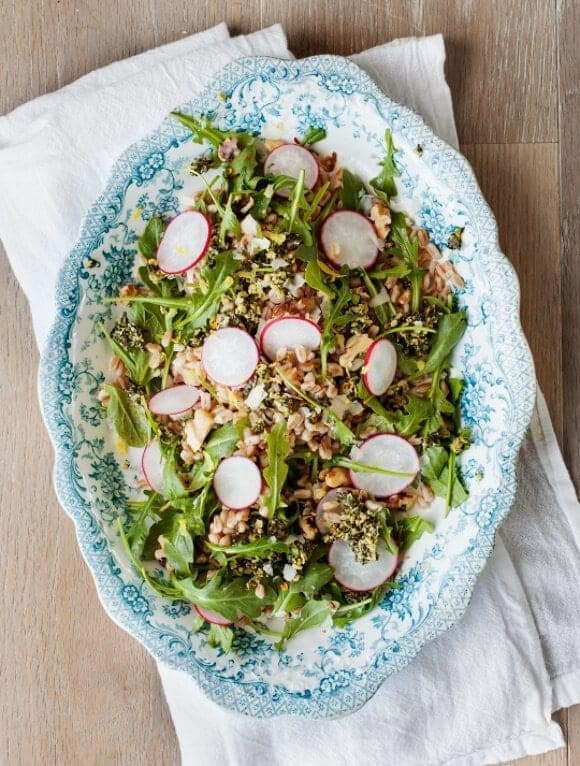 Love a delicious salad with hearty grains and veggies. This looks perfect! This looks fantastic!!!! Thanks for sharing. This was perfect! I was craving pesto and made this last night. I ended up swapping in peal barley for the farro and added some chickpeas and avocado. Thank you!